In North Carolina, more than 40 distilleries are now producing and selling liquor. Many offer tours and subsequent tastings. Each visitor can then buy a single bottle from the distillery. Every 12 months. Distilleries refer customers who want more liquor to a local ABC store, where sales aren’t limited. Some people go but many others don’t, and the respective distillery loses sales and the resultant revenue. A bipartisan bill filed Thursday would change that. Senate Bill 155, by Sen. Rick Gunn, R-Alamance, would increase purchase limits from one bottle to five bottles per customer. It would allow the creation of a special permit letting distilleries offer free tastings at events, such as trade shows, conventions, street festivals and, following the lead of other states, state ABC stores. Distillers could pour no more than 1.5 ounces in total per customer. Another provision in the bill would allow restaurants to sell alcohol starting at 10 a.m. Sunday, according to local rules. Other primary sponsors of S.B. 155 are Sen. Dan Blue, D-Wake; and Sen. Kathy Harrington, R-Gaston. The bills was referred to the Committee on Rules and Operations of the Senate. The “one-bottle law,” which became effective in October 2015, was a catalyst for entrepreneurs and nascent distillers. Many of North Carolina’s alcohol laws date to the 1930s, and the state didn’t lift its ban on making liquor until 1979. North Carolina didn’t get its first legal distillery until 2005, when Piedmont Distillers of Madison came online. Wineries and breweries have grown exponentially, although each continues to fight their own regulatory battles. Distilleries, it can be argued, have been badly outmanned and outgunned by ungainly piles of rules, regulations and resistance. Their perseverance is starting to pay off. Gunn is optimistic about the bill’s chances and says the measure would drive economic growth in terms of creating capital and jobs all the while promoting and nurturing state agriculture. Distilleries give priority to producing and bottling their diverse products, and money for marketing and other promotion is often limited or nonexistent. Allowing distillers to sell five bottles to one customer could do wonders for revenue and growth. Copper Barrel makes a line of clear and pure fruit moonshines, including blueberry, black cherry and strawberry, all originating from the historical recipes of master distiller Buck Nance. Often, Smith says, people want to buy the white lightning but want a fruit shine as well. “A good 75 percent of customers want to buy two” products, Smith says. The bill, says Gunn, strikes a great balance on the tenuous boundary separating the free market and government rules and regulations, including the ABC system, whose stores would offer tastings. Tastings allow consumers to get some idea about the product before plopping down $30 or so for a bottle. 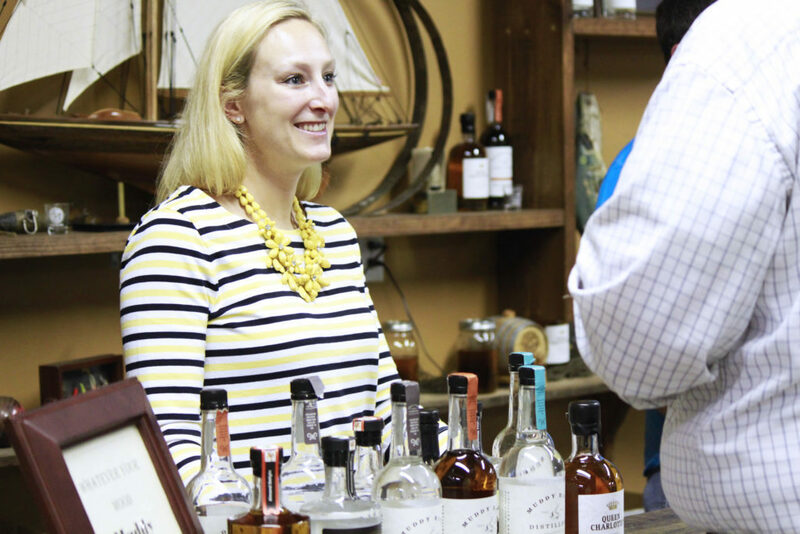 Leanne Powell often travels to South Carolina for such tastings and also often sells out of her product. “I’m very, very excited about the fact that they’re doing this,” says Powell, president of Southern Grace Distilleries, which now distills, barrels and bottles in what used to be the Cabarrus County Correctional Center in Mount Pleasant. Southern Grace makes its signature 130-proof Sun Dog corn whiskey and, by year’s end, will offer five products. “That is a great opportunity,” she says. North Carolina neighbors Kentucky and Tennessee continue to pass laws promoting distilleries and those states’ historic ties to making and selling liquor. In late February, Virginia Gov. Terry McAuliffe signed a pair of bills allowing that state’s distilleries to sell bottles at events that feature the spirits and focus on teaching people about them. That law becomes effective July 1. Carolina Journal Managing Editor John Trump is the author of Still and Barrel: Craft Spirits in the Old North State (Blair, 2017).